Despite his consecration at the pointy end of the non-sleeper spectrum, I always dreamed of travelling as much as possible with my baby. I had spent the past five years wandering the globe with my lovely partner Paul – writing in inspiring (or at least air conditioned) places and just generally feeling like a citizen of the world. The reality that this tiny, crazy human brought with him, however, made me feel like my days of sitting in a Starbucks on Central Park West or visiting a colonial-era hotel in the heart of Bombay were behind me. The nail in the coffin came when Virgin demoted me to bronze status from my well-earned position in the silver bracket. Yup, my world was now smaller than a seat in economy with zero chance of an upgrade. Bummer. It took nine sleep-deprived months caught up in an extended newborn haze before Paul and I were ready to venture out with Crazy Max the Insomniac. The destination: Fiji. The goal: Get the hell out of town and remember what it’s like to view the world as a pretty, shiny oyster. We booked flights to coincide with Max’s nap (the 3.5-hour trip to Fiji is great like that), gave ourselves gold stars for getting everything into two mid-sized suitcases and didn’t look back. The decision to travel to an island, rather than stay at Port Denaru or the Coral Coast is a tough one for any family. It’s hard to know whether that extra boat ride (about an hour to one of the outlying islands) will push everyone over the edge of sanity and basically ruin the whole holiday before you’ve even checked in. 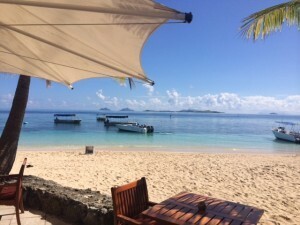 But, and I say this with not a single skerrick of doubt, Fiji’s Mamanuca Islands boast an overabundance of opportunities to escape, have a proper holiday and feel breathtakingly at ease. People who knew how much Paul and I travelled before bub came along would chuckle (almost with relish?) when they said, “Holidays with kids aren’t real holidays.” But we quickly found that Fiji’s glowing reputation as a family-friendly destination, even for ten month old crazies, isn’t built on fairy stories. We flew into Nadi, Max danced his way through customs courtesy of a lovely ukulele band and their sweet Polynesian tunes, and we quickly found a cab to Denarau Marina to board a vessel for Castaway. We decided against any additional tours as soon as we stepped onto Castaway. Although there’s plenty to do and see on the surrounding islands (snorkelling, village tours and loads of water sports), Castaway is like a tropical force field that keeps visitors firmly encamped on the beach or by the pool for the duration of their stay. The opportunity to really relax for the first time since becoming a mum. The people on Castaway possess the kind of warmth that banished any concerns about handing over my child for an hour or two each afternoon. It gave us an opportunity to nap, snorkel, nap and borrow one of the island’s paddle boards to put our core strength to the test (we failed that one, by the way). As the only hotel on the island, there’s 70 thatched-roof bures spotted across 174-acres of land. Each bure sleeps up to four people (a king bed and two singles) and features hand painted ceilings, air conditioning, a fridge, coffee and tea facilities and cots for the younger lot. Max was a bit too young for the kids’ club, but the island offers a troop of babysitters for around $5 per hour, all of whom are available 24/7. This gave us the opportunity to buy small parcels of time without feeling guilty about leaving Max for too long. We would often take an hour or two in the afternoon, then put Max to bed in the evening and ask someone to stay with him while we went down to dinner. Max decided very early on that nakedness was going to be his modus operandi for the entire trip so the few times we did need to get clothes on him were a bit of a battle. We let go of routine and rules and let Max hoe into an ice cream every afternoon. Watching our tiny son annihilate a cone in the sand while we looked out across the South Pacific was pretty magical. Meals at Castaway are designed to be crowd pleasers. There’s a buffet in the main dining room for breakfast, lunch and dinner. It includes a cooking station that churns out omelettes for brekkie, grilled seafood at lunch and steak the way you like it at dinner. The kids can choose from a few different pasta options, as well as the usual lineup of chips, salad and dessert done a thousand ways. It’s decent fare, but foodies might be a little disappointed. There’s also a handful of other restaurants that are all included in the meal plan. What was the most significant thing Max got out of it? Max isn’t old enough to remember the trip, but I do believe that he learned to be more flexible during our five night stay. I know I certainly did. The idea that lunch doesn’t have to be at noon, or that bedtime can be shifted an hour or two, was an important lesson for us. Even babies can engage with a travel experience. Watching Max relax into his naked island holiday helped me get in touch with what this motherhood business is all about. I learned how to spend time with my new family and I got a glimpse of how things could be in the future. As the CEO of a soon-to-be-listed tech company, that one utterance was all the proof I needed that we will become regulars on Castaway.